Waterfront & Pet Friendly Home with Boat slip included. 3 Bedroom 2.5 Bathroom Home Centered Around a Marina with free access to pool. Coral Lagoon Resort, located immediately adjacent to Key Colony Beach, is the Fisherman's dream resort, with a full-service Marina and a tranquil setting featuring luxury townhomes. This resort is located on nearly six acres of beautifully maintained property and flourishing scenery. "Salty Fare" is one of a few single-family homes at the resort which offers a bright, tropical interior with the additional windows on all sides of the house. Coral Lagoon Resort also features a heated, in-ground pool with ample poolside seating in both the shade and the sun. The over-sized, covered back porch provides peaceful canal views and features plenty of seating room for lounging in the sun or enjoying the ocean breezes. The outdoor dining area provides seating for up to 8 guests. 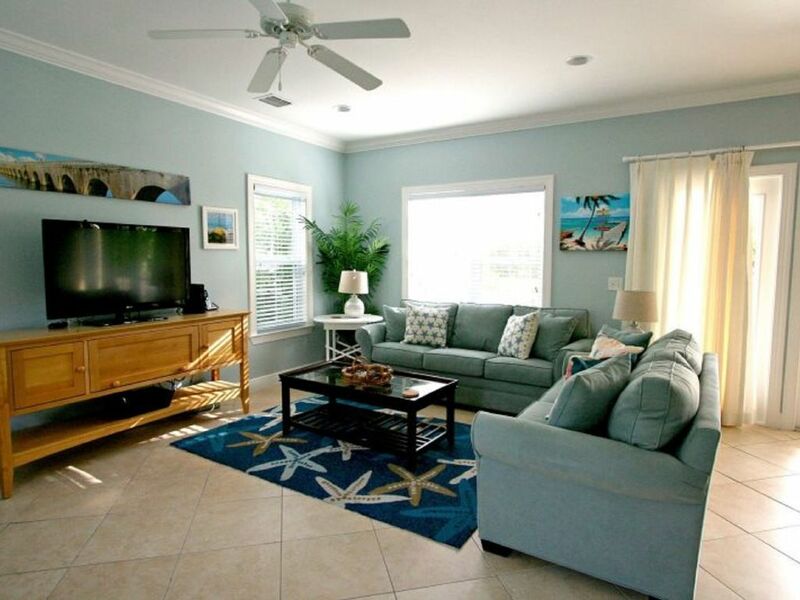 "Salty Fare" was just recently remodeled in May of 2015 featuring new living room furniture, including a sofa sleeper, new bedding, small kitchen appliances, and a cheerful tropical ambiance! Entertain or unwind in the 1st-floor living area. The floor plan of the great room offers plenty of space to relax and dine. The living room has plenty of seating in front of the flat screen TV. The kitchen consists of stainless-steel appliances, elegant granite counters, and wood cabinets. Coffee lovers will be satisfied with their choice of a Keurig single serve coffee maker or the traditional coffee pot. Enjoy a quick snack on the stools at the breakfast bar or dine-in at the dining room table that provides seating for up to six people. Upstairs bedrooms feature a soothing color scheme and comfortable bed linens. The master bedroom offers a luxurious King size bed, a private bath, a flat-screen TV and a romantic private balcony with seating for two. The 2nd bedroom has a Queen sized bed and the 3rd bedroom has two Twin sized beds. This home will sleep six people comfortably in beds and also features a Queen-sized sleeper sofa with a Sealy mattress. All bedrooms feature cable equipped flat screen tvs with built-in DVD players. Bringing a boat? Not to worry, Coral Lagoon Resort accommodates every fishing and boating need, providing guests with use of the onsite, full-service marina adjacent to the resort grounds. Boat slip #4, located directly behind the home, is included with your vacation rental and provides adequate room for vessels up to 30 feet in length. Limit one vessel per slip, 34' max length of the vessel. Coral Lagoon is the perfect vacation destination offering something for the serious mariner as well as a relaxing atmosphere for non-boaters. Fishermen love the fuel service on site while others prefer to kick back and relax around the pool. Either way at night you can retire to a real beach home that's so much more inviting than a hotel room. Guest enjoy the benefits of working with our full time, friendly, professional vacation specialists. We have staff on call to attend to any needs that may arise. Bookings are safe and secure with our company, you can even stop by any say hello to our staff at our office on US 1. No need to bring any linens we provide them right down to the pool towels. For our guest convenience, we supply your initial products likes toilet paper, paper towels, dish soap, laundry soap, trash bags, coffee, shampoo, soap, and even a snack or two. Full service Marina with Dockmaster on site. Community Pool with bathhouse. * Nightly rates * 3 bedrooms - king, queen, two twins * 2.5 baths - private in master * boat slip * upper and lower porch * 1400 sf extremely quiet and peaceful * docking * refrigerator/freezer range microwave dishwasher washer and dryer comcast cable large living room * no fishing from resort grounds Maximum allowed is 8 people. There is a $15 fee per night per person over 6 people up to maximum of 8. More than 8 people are not allowed based on square footage of this villa If you rent for more than 1 week but less than 2 weeks each additional day over 7 days will have a specific nightly rate for those additional nights. Please inquire about the rate for those nights as the rate is dependent on time of year. My family and I had a great stay the house is very spacious, beautiful, and comfortable. I loved being right at the water since we had our boat readily available. The rental company was a delight to work with and always available for any questions we might have. It felt like home and we would definitely stay again... The only thing we were disappointed about is that there is not a place to wash your boat after pulling it out of the salt water before heading home. Other than that we had an amazing vacation and will probably be visiting again next year!!! Thank you for the great review. We are thrilled that you all had a great time. We hope to see you again next year! We loved it! The condo was beautiful and the location was great! Thank you for your review! We are thrilled that you all enjoyed your stay and the home. Coral Lagoon is such a special place. We hope to welcome you back for your next vacation. We are thrilled that you enjoyed our rental. Better than expected. Very clean, new place with tons of room. Provided a care package with necessities like soap, laundry detergent, etc. Very nice. Great boat access, perfect location. Only strange thing is that the slip wasn't directly in front of the unit. Not bad though it was only a few spots up. A+. Will stay with them again. Thank you so much for the kind review. We are thrilled that you all enjoyed your vacation and we hope that you come back to Paradise again. We came down to The Keys for the first time in August 8th and stayed for one week. The house is very spacious. We stayed my husband and I with our four children and small Maltese dog ( allowed by the owner for a small pet fee). We were able to eat outside for dinner, the porch has a nice size patio table with chairs. The view of the canal is so nice and peaceful. The upstairs has a very nice master bedroom with a huge balcony. Our children loved their bedroom. One with the twin beds was perfect for my two youngest children (3 and 6) and the other bedroom with a queen size bed was perfect for my two oldest (11 and 13). The stack-able laundry on the landing was perfect to have. I did not over pack since I knew I could wash clothes there. We would love to go back there. Its location is just perfect minutes away from Duck key and maybe 1 hour and 30 min from Key West. The groceries store (Publix or Win Dixie) are maybe 20 minutes away. The property was very clean. I just have nothing bad to say about it. You will have a great time. Thank you so much for your kind review. It is our hope that all of our renters have the same type of experience. We live in a beautiful place, and we sure don't mind sharing our home in the Florida Keys! We look forward to renting to you all again! Coco Plum Vacation Rentals appreciates your kind words and your business. Coral Lagoon Vacation Rental homes are located directly in the center of the island chain known as the Florida Keys. Marathon offers many water themed activities for your vacation guests. Nowhere else in the US can you tour a fully operational Turtle Hospital where they rescue, rehab, and release sick and injured sea turtles offer educational tours of their unique facility 3 times per day. This is a must do while in Marathon on vacation. Marathons newest gem is Aquarium Encounters as seen on the TV show Tanked. At Florida Keys Aquarium Encounters attractions revolve around their unique aquarium encounters. You can get up close and personal with Sharks, Stingrays and all the other sea life typically found on the Florida Keys Coral Reefs. So much more than an aquarium this venue is a destination to see, touch and learn about the unique marine life in the Florida Keys. Sombrero Beach is a free public beach located near mile marker 50 or if you drive to the other end of the famed Seven Mile Bridge you can visit Bahia Honda a Fabulous state park. Walk, bike or roller blade down the famed Seven mile bridge and see how many different species of marine life you can identify along the way. Rent bikes, paddle boards or kayaks and have them delivered to your vacation rental home. Or perhaps you want to take a snorkel or dive trip on one of the many charters to Coffins Patch or Sombrero lighthouse marine sanctuaries where you will feel like you are on an Caribbean Island. If you didn’t bring your boat there are plenty of boats and captains for hire to take you fishing for sharks, tarpon, bonefish, snapper, dolphin, tuna or sailfish. If nightlife is your thing take a trip down to Key West to take in the magic of sunset on Duvall Street or sample the many culinary delights. Fort Jefferson is another must do day trip out of Key West into the Dry Tortugas. In Marathon you can do as much or as little as you like. If this all sounds too stressful perhaps catching up with your favorite novel poolside with a Margarita in hand better describes your perfect vacation. Whatever you vacation dreams Coco Plum Vacation Rental homes have the perfect place for you to make your dream into a Keys Reality! Check in is 5 pm or later. Again, for complete and accurate information, please view our site.